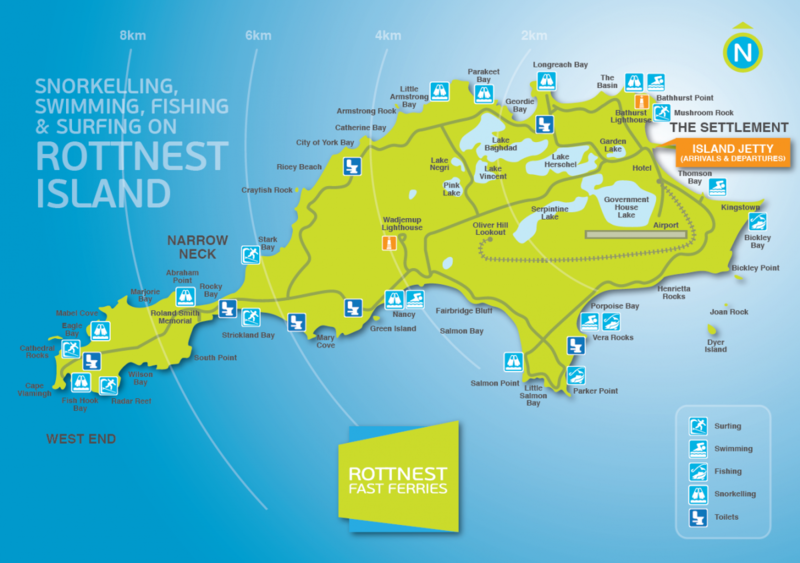 Rottnest… WA’s most beautiful island is just 18 kilometres off Perth’s coastline, and a lightning fast 40 minute ocean crossing in air-conditioned comfort on one of our high speed ferries. Some services are wheelchair accessible for items with a width of up to 88cm. Please ensure you let us know at the time of booking if you will be travelling with a wheelchair so we can ensure you travel on a suitable vessel. Failure to notify us of your requirements may result in the service being unavailable on arrival at the ferry terminal. Unfortunately our courtesy coach transfer services are not wheelchair accessible, unless passengers are able to navigate stairs and have a fold up wheelchair. Please note that high tides due to bad weather may cause slight difficulty during boarding or disembarkation. 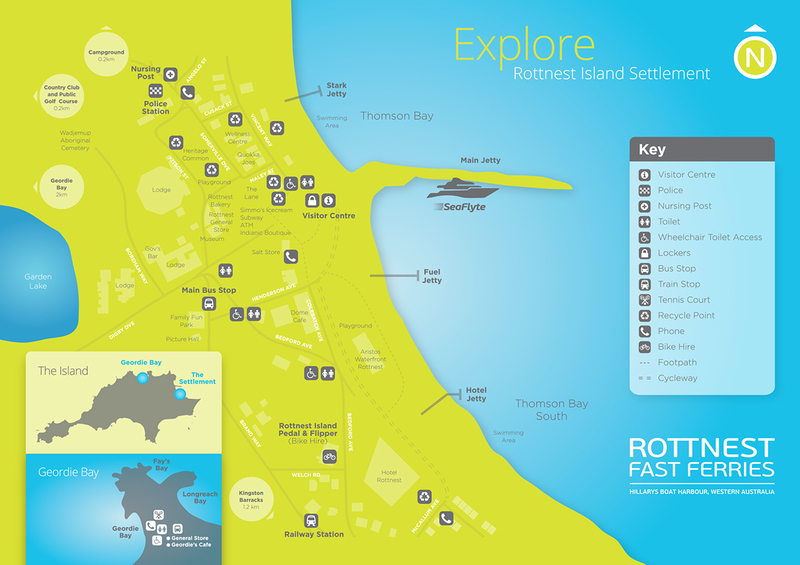 Once on the island, the main settlement (small shops, cafes and restaurants) is also accessible by wheelchair and we recommend contacting the Rottnest Island Visitor Centre on 9372 9732 to see what island tours would best suit you. The ability to take the pram on board the vessel will vary depending on the particular vessel in use and the capacity of the service. In most circumstances, it is possible for children travelling in a pram to remain in the pram on board the vessel, however if the service is particularly busy, the pram may be requested to be folded and stowed securely, with the child seated with their parent or guardian. When permitted on board, prams must be able to travel along the gangway and fit through the vessel doorway (max 88cm). If the pram cannot fit, it must be folded and stowed securely. Public Transport is available to and from Hillarys Boat Harbour, we recommend using the Transperth Journey Planner ahead of the day. It is always best to allow yourself plenty of time when catching public transport, and it is a good idea to check the Transperth website for service disruptions on your date of travel. Hillarys Boat Harbour is approximately 20mins drive north of the Perth CBD. Once on the Mitchell Freeway, drive north until you reach the Hepburn Avenue exit where you turn left, and continue towards the coast – Hillarys Boat Harbour is at the end of Hepburn Ave. Free parking is available on the south side of the Harbour. 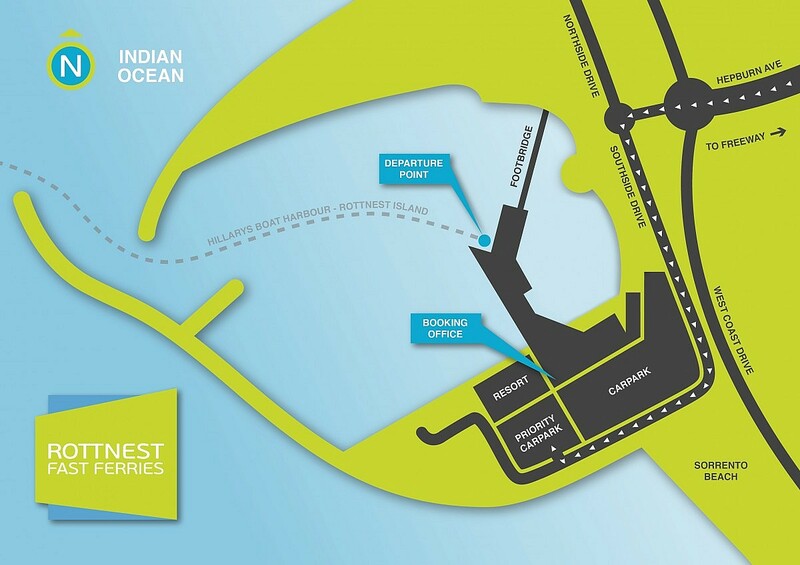 See map below for our ticket office and departure point within the Harbour. Don’t have a car? 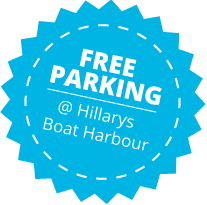 Free coach transfers are available from your hotel to the ferry terminal at Hillarys Boat Harbour. Please note that bookings at least 24 hours in advance are essential for coach pick ups. The Rottnest Island Authority in conjunction with Rottnest Fast Ferries have introduced a luggage procedure that is designed to improve the effectiveness, efficiency and accuracy of luggage delivery on Rottnest Island. To have your luggage delivered to your accommodation on the island, luggage labels will need to be purchased from our office at $3.00 per item. Those who book and pay seven or more days before their departure date are eligible to purchase luggage labels at a discounted rate of $2.00 per item, and these will be posted out to you free of charge. This allows you to bypass the office completely on the day of departure, and avoid the queue. However these labels must be purchased at the time of the booking to take advantage of the discount, any labels that are purchased within seven days of departure will cost $3.00 each. Once booked if your travel arrangements change then new luggage labels will need to be re-issued at your departure point for an additional surcharge. Please see our staff prior to departure if you need to change your labels. Unlabelled/ incorrectly labelled luggage – please check with staff prior to departure. Sporting equipment (including bikes, surfboards, golf clubs etc.) – sporting equipment incurs a freight charge which will need to be organised either when booking, or at our office prior to departure. Note: once on the island certain items can be delivered for a fee – see the visitors centre for more information when you arrive, or call them on 08 9372 9732.